Sky looks set to launch its first video on demand (VoD) service in March, enabling viewers to watch programmes when they want to watch them, rather than when the broadcaster chooses. The digital satellite broadcaster said that one million Sky subscribers would be able to take advantage of the service which will use previously untapped hard disk storage capacity in recent Sky and Sky HD set-top boxes. The latest generation Sky boxes for example have a 160GB hard disk inside although only 80GB is currently used for recording programmes. Video on demand is nothing new. Companies like Homechoice have been delivering it to consumers for years, but many have been hampered by the fact that they can only serve certain geographical areas thanks to infrastructure constraints. Sky's satellite-based Anytime TV service, by contrast, will work on a nationwide basis from launch. Sky made the Anytime TV announcement at its headquarters this morning where it also announced its interim financial results for the six months to the end of 2006. The company said that one million customers had signed up for its 'triple play' service which combines digital satellite TV, broadband access and telephone services into a single package. Sky also said that it had grown the number of people using its subscription TV service by 183,000 to 8.441 million. 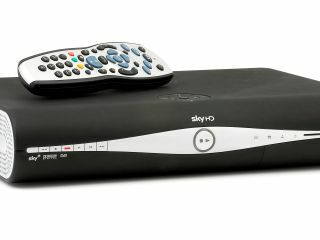 Sky also revealed that it had now sold 184,000 Sky HD boxes - up from 96,000 at the end of September - making it the fastest growing TV accessory on sale today. Sky said 15% of its HD subscribers were new customers who had never used any of Sky's services before. The broadcaster also said that Sky subscriptions have broken through the 2 million barrier for the first time with 31% of viewers new to the company. Driving growth in its internet broadband business - Sky Broadband - has also been a priority for Sky. The company said it now had 259,000 customers, up from the 74,000 it had at the end of October last year. Of the 259,000 subscribers Sky said 70% had opted for faster broadband speeds rather than taking the low cost option. 18% of subscribers had also never used Sky's services before. The company has also signed up 223,000 people to its Sky Talk telephone service, executives said. Commenting on Sky's growth figures CEO James Murdoch said: "With over one in four of our customers now taking an additional service from Sky, more people are choosing more of our products than ever before. In 2007, we will continue to drive towards our goal of being the leader in entertainment and communications in the U.K. and Ireland."